MENLO PARK, Calif. – From strengthening government services in the developing world to supporting investigative reporting here at home, The William and Flora Hewlett Foundation has announced over $47 million in new grants to 137 organizations. The Education Program, which makes grants to improve education across California and around the world, awarded $11 million in grants to 40 organizations. After consulting with a broad range of education experts nationally, the Foundation recently adopted a new strategy for its Education Program. The Program will dedicate a part of its grantmaking to support what it calls “deeper learning” practices, which prepares students to master core academic content, think critically and solve complex problems, work collaboratively, communicate effectively, and learn how to learn on their own. To help California improve how it finances public education, the Foundation made a grant of $1.5 million to Pivot Learning Partners in San Francisco to fund its pilot project in the Los Angeles, Pasadena, and Twin Rivers school districts to demonstrate better spending practices. A grant for $500,000 went to the Ontario College of Art & Design in Toronto to help it develop guidelines for open educational resources so that they are accessible to all learners. The Environment Program, which makes grants to protect western lands and address the problem of climate change, announced $12.3 million in grants to 33 organizations. A highlight of these grants is $1.2 million to the Center for Sustainable Transportation of Mexico in Mexico City to promote the development of Bus Rapid Transit systems in various cities in Mexico. These bus systems help reduce carbon emissions, improve energy efficiency, and reduce air pollution. A Bus Rapid Transit bus glides down a dedicated bus lane in Mexico City. These buses help reduce pollution, as well as lower traffic congestion. Among grants to help conserve lands in the western United States, the Foundation gave $1.13 million to The Wilderness Society in Washington, D.C. This grant will help its Bureau of Land Management Action Center seek better management of 6 million acres of Bureau of Land Management land; achieve a 50 percent reduction in areas that permit off-road vehicles in Colorado, Utah, and Arizona; protect roadless lands from fossil energy leasing; and support new solar energy projects on public land. The Global Development Program, which is dedicated to promoting equitable and sustainable economic growth in the developing world, made $13.6 million in grants to 17 organizations. One way to reduce poverty in developing countries is to ensure that their governments use revenues for its intended purpose. To that end, the Foundation made a $3.25 million grant to the Results for Development Institute in Washington, D.C. The grant, which is being augmented by $750,000 from the Bill & Melinda Gates Foundation, will be used in the Institute’s Transparency and Accountability Program. This program strengthens the ability of civil society organizations to monitor government budgeting and expenditures for health and education. To help evaluate the effectiveness of poverty reduction programs in sub-Saharan Africa, the Foundation made a grant of $1 million to the University of Cape Town, one of the continent’s premier research and training institutions. With the grant, the university will train African scholars to evaluate social programs in sub-Saharan Africa and to use the results to inform policy decisions. The Performing Arts Program, the largest funder of performing arts organizations in the San Francisco Bay Area, made $4.7 million in grants to 24 organizations. Among its goals are to assure that exceptional works of art are created, performed, and preserved. 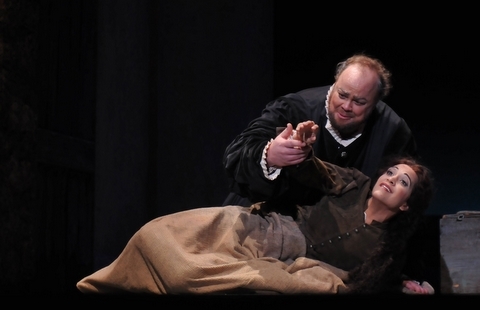 Actors with Opera San José, a Hewlett grantee, play the roles of Rigoletto and Gilda in Verdi’s Rigoletto. Photo courtesy of Pat Kirk/Opera San José. A highlight among these grants is one for $360,000 to Opera San José. The funds will enable the opera to continue to develop and groom emerging artists for sustained international careers. A second grant, for $150,000, went to the West Bay Opera Association in Palo Alto to help it increase outreach to Asian and Latino communities, continue its educational programming, and build its base of support among local corporations. To support theater in the Bay Area, the Foundation also made grants of $180,000 to Intersection for the Arts, and $110,000 to Z Space Studio, both in San Francisco, for general operating support. The Population Program, which makes grants to improve family planning and reproductive health in the United States and around the world, gave $3.3 million in grants to 11 organizations. for the 3rd Street Youth Center and Clinic. The clinic offers comprehensive health and family planning services in Bayview Hunters Point, one of San Francisco’s most disadvantaged neighborhoods. Also, a grant of $180,000 went to the Latino Community Foundation in San Francisco to help it reduce the high rate of teen pregnancies among Latinas in the state. When a suitable opportunity arises, the Foundation occasionally makes grants beyond the purview of its individual programs. Sometimes these are collaborations across Hewlett programs, but they also can be other promising philanthropic activities. This fall, it announced 8 grants to 6 special projects. Aware that investigative reporting has been decimated by the decline of U.S. newspapers, the Foundation made a $150,000 grant to ProPublica, the nonprofit, investigative reporting organization that partners with other media. It is based in New York City but works nationally. 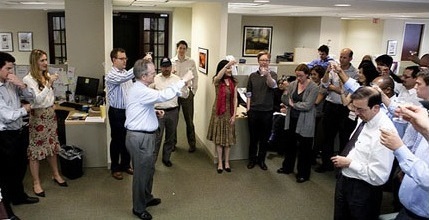 ProPublica Editor-in-Chief Paul Steiger hoists a glass to toast the nonprofit journalism enterprise’s first Pulitzer Prize. Contributor Sheri Fink won the 2010 Pulitzer Prize for Investigative Reporting for her article about New Orleans Memorial Medical Center in the wake of Hurricane Katrina. Photo courtesy of Dan Nguyen/ProPublica. A grant of $600,000 went to the Greater Washington Educational Telecommunications Association based in Arlington, Virginia, for general support to the PBS NewsHour, the influential, hour-long public television broadcast.